Remembering New Orleans' Overlooked Ties To Slavery The city has a reputation for music, food and fun. But it's also a land with an economic history rooted in the domestic slave trade that tore families apart. Now, its legacy sits below the surface. 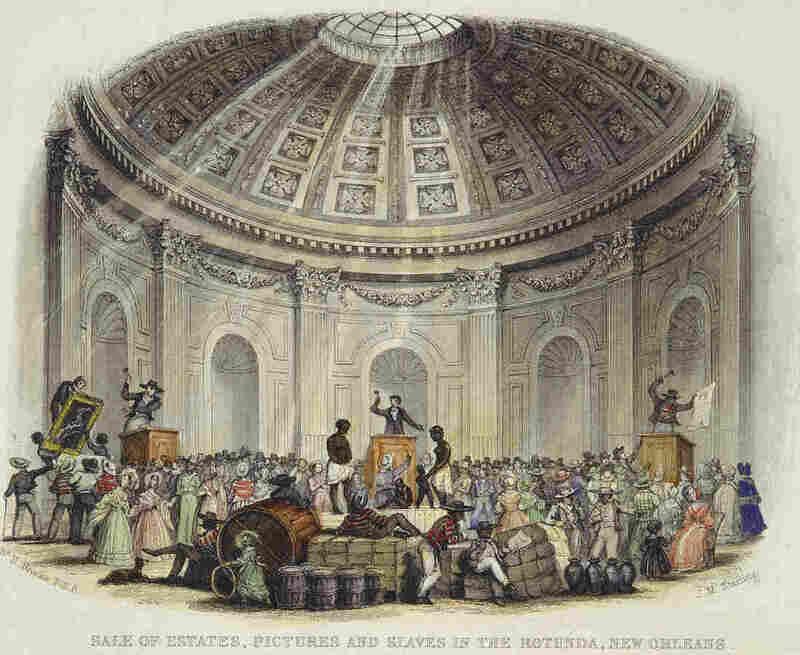 Interior view of a room with a rotunda ceiling during an auction of slaves, artwork and goods. After the U.S. banned international slave trading in 1808, more than 1 million people were forcibly moved from the Upper South to the Lower South. Often, the first stop was the slave markets of New Orleans, where families were divided for good. And today, little evidence of what happened in these places, and to these people, remains. Back when cotton was king, New Orleans was its queen city. "Slavery and cotton go hand in hand," historian Erin Greenwald says. "It is a place where cotton is bought and sold, shipped to and shipped from, and the same is true of the slave trade here." Greenwald curated an exhibit at the Historic New Orleans Collection called "Purchased Lives" about the domestic slave trade. She says other Southern cities confined the slave trade to a single building or street. But that wasn't the case with New Orleans. "New Orleans was completely saturated," she says. 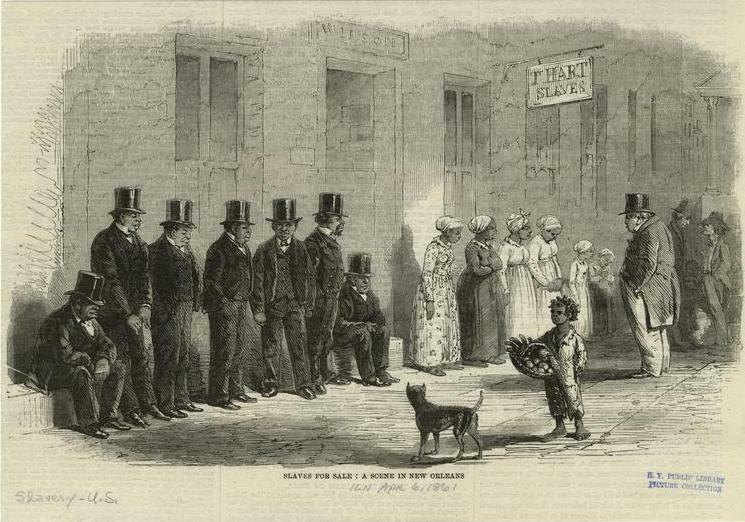 Enslaved people were sold in the middle of the business district. They were sold on boats, in French Quarter courtyards and in the most sumptuous room of the most luxurious hotel in the South, the St. Louis Hotel. Today, there's no plaque on the facade of that building to announce that an auction block once existed there. In fact, Greenwald says, New Orleans has very few physical markers commemorating this history. "People's tendency is to celebrate the past. And so it's harder to get, I think, a city to want to commemorate or recognize something negative from the past," she says. It's not unlike the debate happening now with flags and symbols of the Confederacy. Slavery broke up countless families, and after it was abolished, people wanted to reunite. But they often had no idea where to start looking. Some placed ads in church-affiliated and black newspapers. "So mothers looking for children that they haven't seen in 30 years don't even know what they look like," Greenwald says. One company, the largest and most powerful slave trader in U.S. history, brought ships full of human cargo several times a month to New Orleans. The company was financed by the federal bank, owned by a Tennessean named Isaac Franklin, who with his partners also had offices in Natchez, Miss., and just outside the nation's capital, in Alexandria, Va.
"This is not a story about New Orleans or the South," says historian Greenwald. "This is a story about the United States, and the foundation of our economy." When Franklin retired from slave trading, he was the wealthiest man in the South. He bought six plantations near New Orleans, where today stands one of the most notorious prisons in the country, Angola State Penitentiary, built on land profited from the slave trade.